A huge thank you to Bob Linscott of the LGBT Aging Project for educating us about the “biggest crisis in the LGBT community since HIV/AIDS” and the work that he and his colleagues are doing to care for seniors in the LGBT community, many of whom don’t have immediate family members to provide caregiving. One new term I learned vertical caregiving (provided by adult children) as opposed to horizontal caregiving (provided by friends or peers if you don’t have adult children that can care for you as you age). This is a website for the documentary Gen Silent he mentioned. Here is the article he referenced called The Lonely Death of George Bell. And this is the website of Edie Windsor, who has been instrumental in the gay rights movement. Related to our conversation last night, there is a free webinar on LGBT older adults and housing discrimination on April 27 at 2pm. You can register here. This year’s MA Gerontology Association spring conference is on the all-important issue of the intersection between aging and disability. More info about the conference, which is on May 11th from 8:30am-1pm, can be found here. And we of course hope to see many of you on May 18th for our last official session of the year. More details to come! We will also let you know about our special members-only event on June 15th. Our panel on design and technology went very well in early April! The room was filled with 80 people of all ranges, many of whom had never been to a Boston Bridge meeting before. Here is a write-up about the panel, including a few photos. 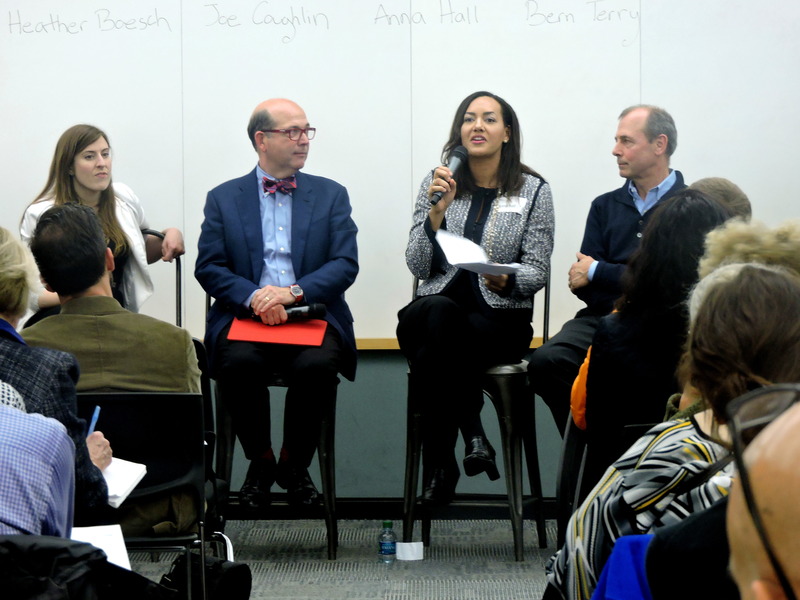 Thank you to Aging 2.0, the MIT AgeLab, and of course Venture Cafe for making this event possible. This is a planned living community for LGBT youth and seniors in Hollywood. What an innovative idea! This article highlights an artist who sketches portraits of hospice patients, and how it affected her views on life and death. A few months ago, I included an article about aging mobsters. Now comes a Vanity Fair article about an unprecedented jewel heist that sounds more like a Hollywood film than a real life occurrence. The average age of the criminals was 75. Here is an article from TIME Magazine about the booming industry aimed at baby boomers (or missing the opportunity). Nothing like the pursuit of money to get industries paying attention to this cohort! It is hard to go an hour without hearing about the upcoming presidential election, but this article focuses on smaller-scale campaigns and political offices that baby boomers are now filling. And on a related note, here is an article in the Wall Street Journal by Marc Freedman about how little the presidential candidates are discussing older adult issues while almost all being older themselves. My grandma’s favorite TV show is CBS Sunday Morning, and in a recent episode there were two segments of note. One segment was about the news anchor Anderson Cooper and his mother Gloria Vanderbilt (age 91), who wrote a book together about their relationship. And this other segment is about boomer grandparents in Queens, NY who play a large role in their grandchildren’s lives. In our meeting last night we touched upon the concept of kodokushi, or lonely death, which is an unfortunate phenomenon in Japan where seniors are dying alone and not being discovered for a long period of time. With a faster growing rate of seniors than even the US, Japan is also at the forefront of a number of innovative measures to ease the aging process. Read more about this here. We have two short videos that perfectly complement our Venture Cafe panel on seniors and technology. The first one is about a Brookdale community, where panelist Anna Hall works, that had two tech entrepeneurs live there for one week to learn about seniors’ needs vis-a-vis technology. The second one is a cautionary tale about the proliferation of smart devices in the homes and lives of seniors. To continue on the video theme, AARP has a new campaign called #DisruptAging and this is a short video that does just that. This PBS documentary explores ways to be financially secure during retirement. This will be useful not only for the seniors we work with but for planning for our own futures! We talk a lot about hospice and palliative care, and this piece explains the similarities and differences in a succinct manner. For those of you celebrating Passover, I hope that it is meaningful and tasty. For everyone, enjoy the warm weather and we will see you in May.